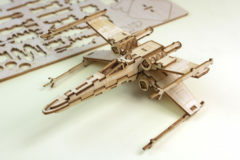 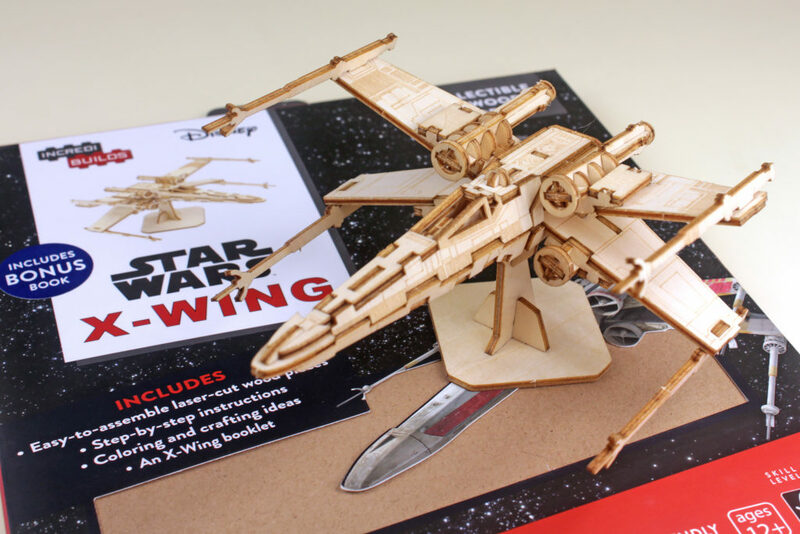 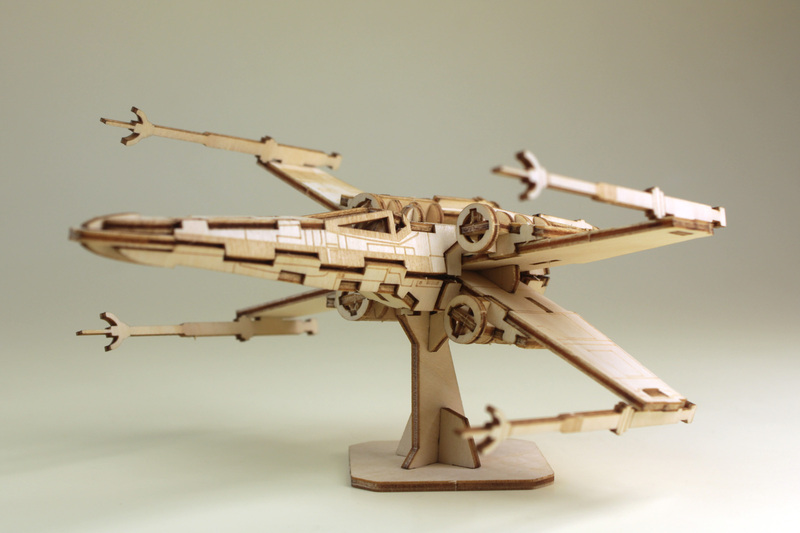 IncrediBuilds are collectible model kitsets, made from laser-cut, eco-friendly, etched wood. 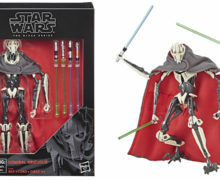 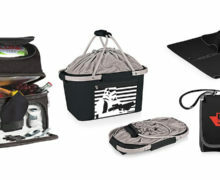 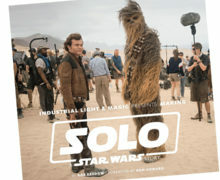 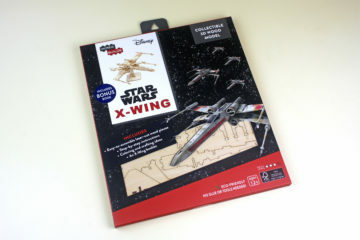 Their Star Wars range of vehicles and characters are fully licensed. 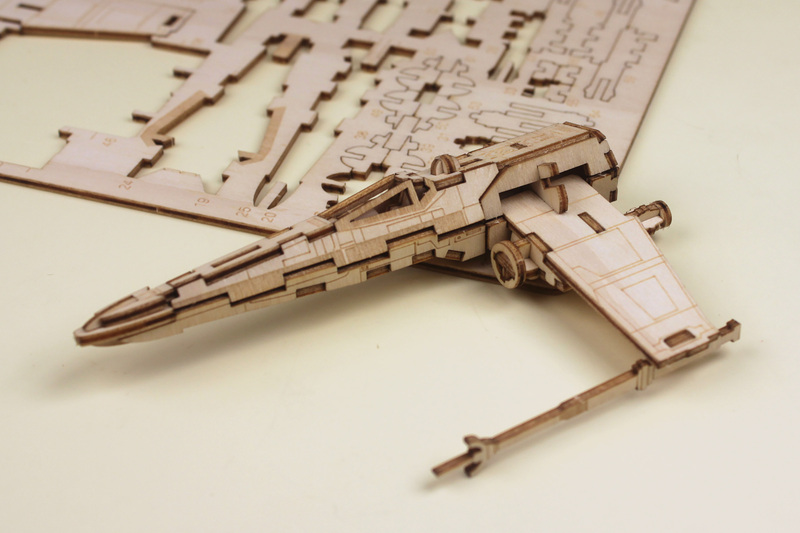 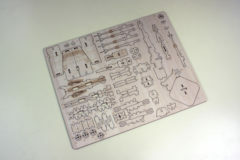 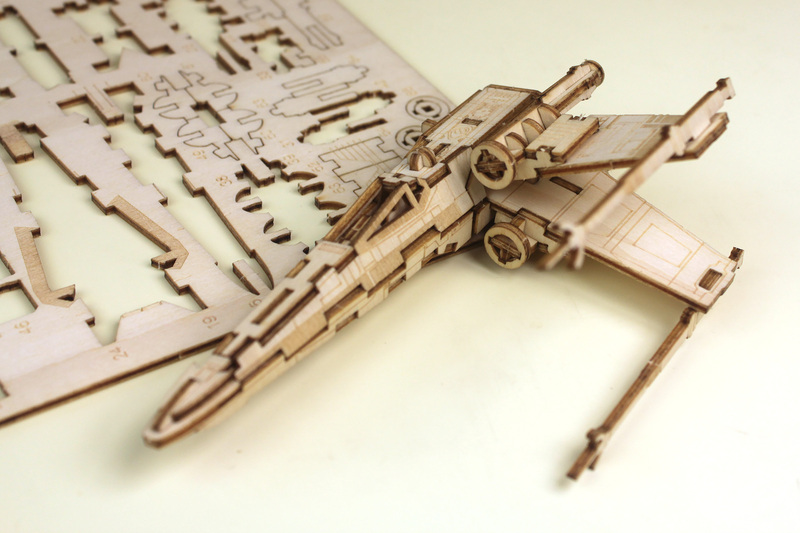 Each IncrediBuilds bundle comes with a laser-cut FSC-certified wood sheet (with line-art detailing on one side), instructions, and an accompanying book describing the starfighter, ground vehicle, or droid in fun detail, with behind-the-scenes info and tips, as well as ideas for customising your IncrediBuilds model. The X-Wing shown here is described as requiring an “advanced” skill level. 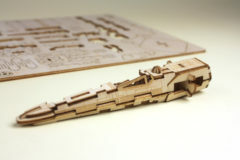 The model is made up of about 70 individual pieces. 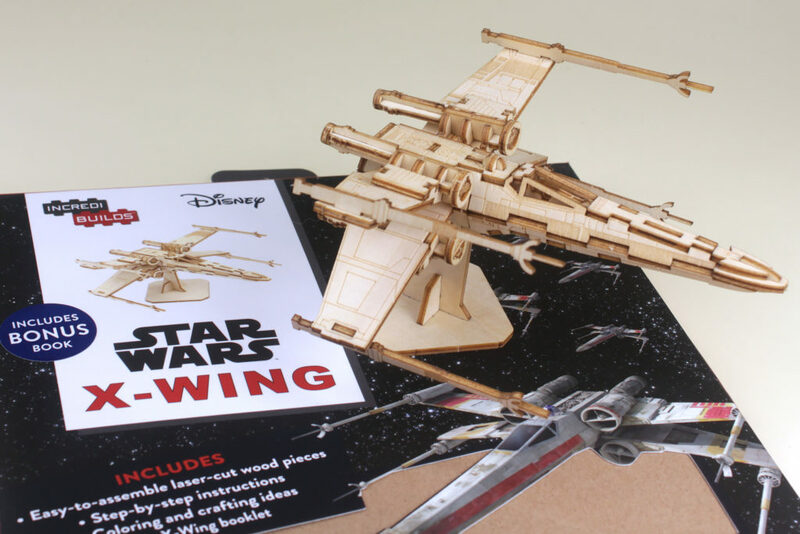 In practice, this means that it may be beyond some young kids, but older children and adults can manage the build if they patiently follow the instructions, and take at least moderate care when handling some of the more fragile components. I found having a blunt, non-marking tool of some sort to help push out some of the smaller elements from the main sheet was useful. Having said that, this isn’t a lightweight balsa model, but rather a precision manufactured plywood product which is surprisingly robust…. 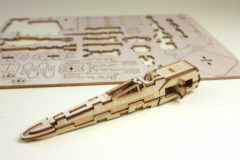 and just in case, a couple of duplicates of the thinnest or most-likely-to-break pieces are included. 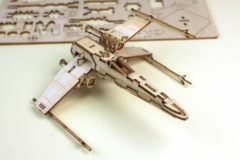 This was my first attempt at assembling an IncrediBuild, and it came together for me in under an hour (including stopping to take the following photographs along the way). I found it extremely fun, possibly even addictive, and surprisingly intuitive with the model design guiding the direction and orientation that the components fit together. It isn’t long before the X-wing fuselage begins to take shape. 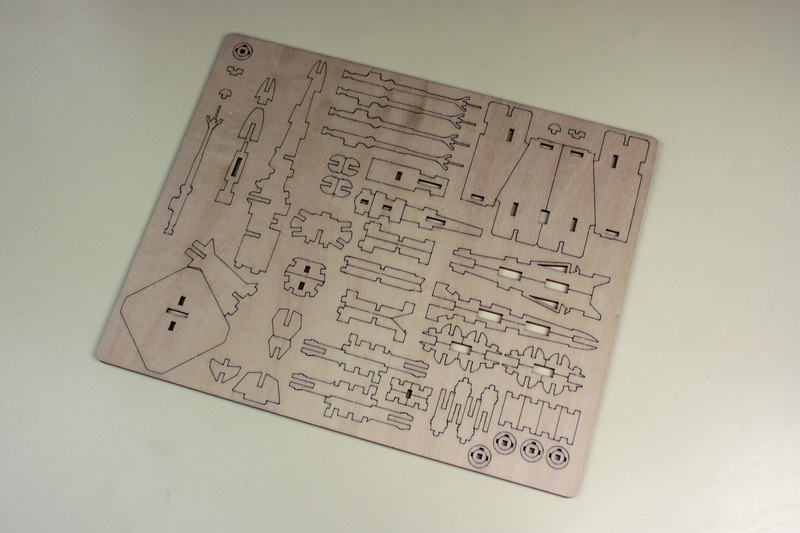 There are nice support structures incorporated into the underlying design to ensure that the side panels fit into place at the correct angles. If you mis-align or mis-place a component, it is fairly easy to remove and replace (although everything snaps pretty firmly into place when correctly assembled). 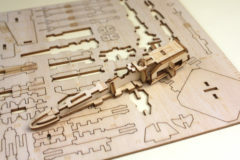 The model pieces are all numbered in the order that they are to be removed and used. 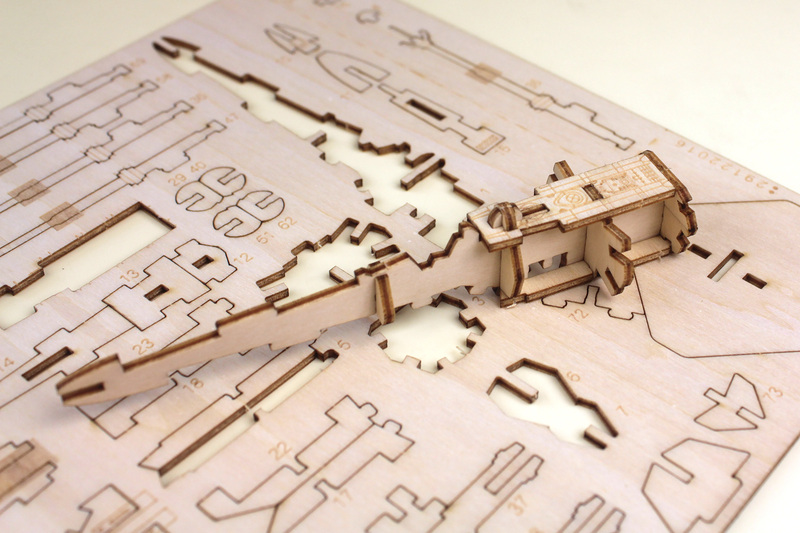 The fuselage is made in its entirety first, then each of the four wings are constructed and mounted in turn. 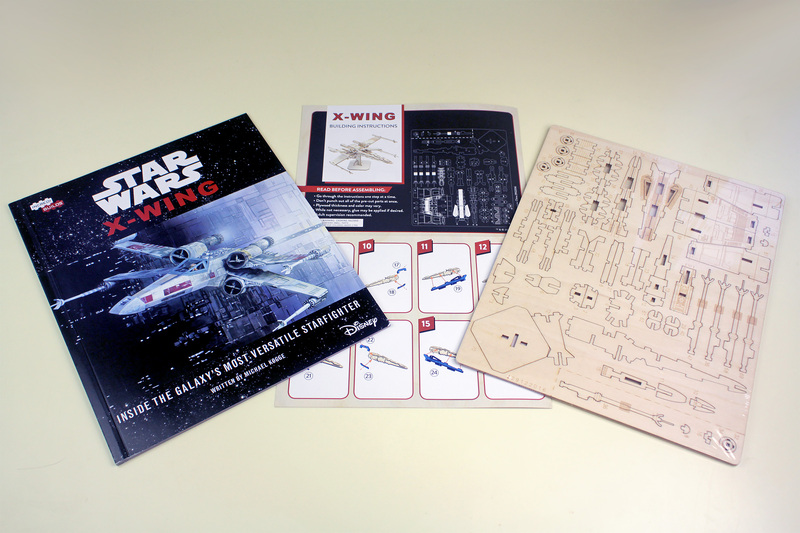 A 4-piece display stand completes the project. Although the instructions suggest that glue (presumably PVA or similar craft glue) can be used, everything felt stable and secure as I was building it without additional glue, and this ensured that a clean wood finish could be achieved. 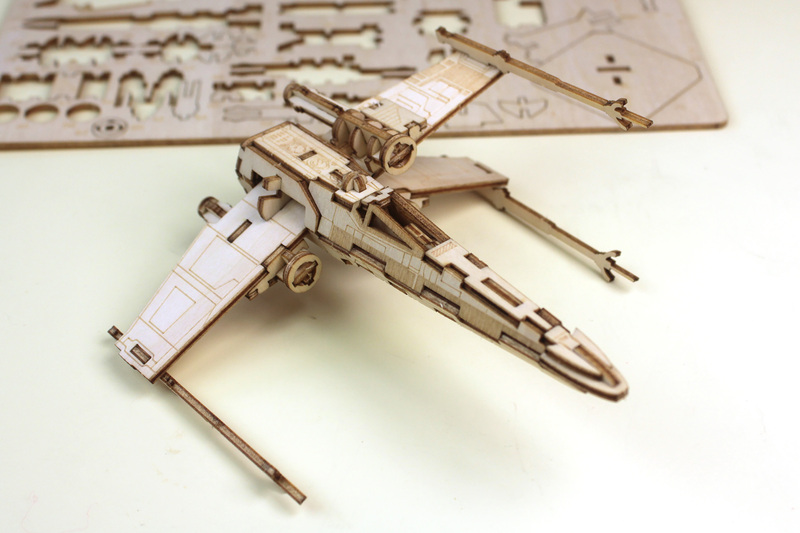 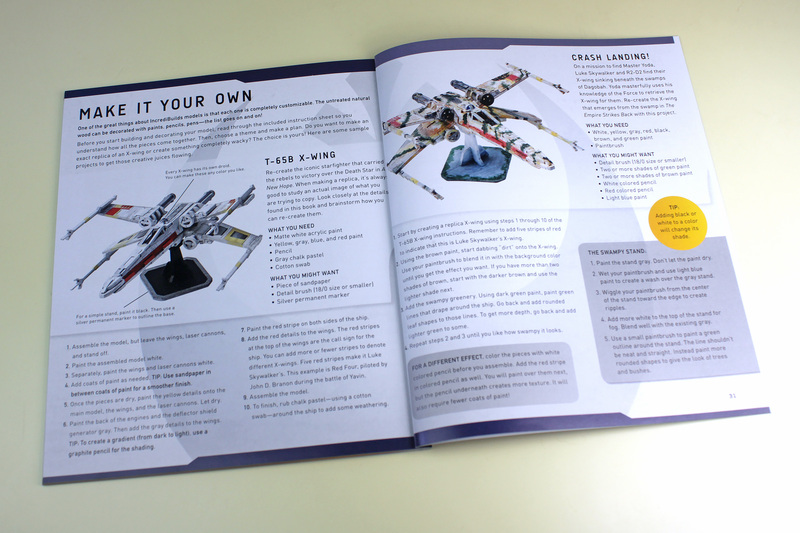 The finished T-65 X-wing starfighter is approximately 12cm in length. It has a small footprint, so displays nicely on a bookshelf or desk. 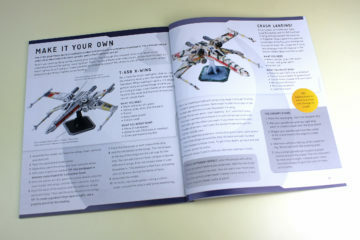 The book that comes with the wooden model kit is described as a “bonus”, but I almost think that undersells it. The regular edition kitsets come with a soft-bound book of approximately 32 pages. 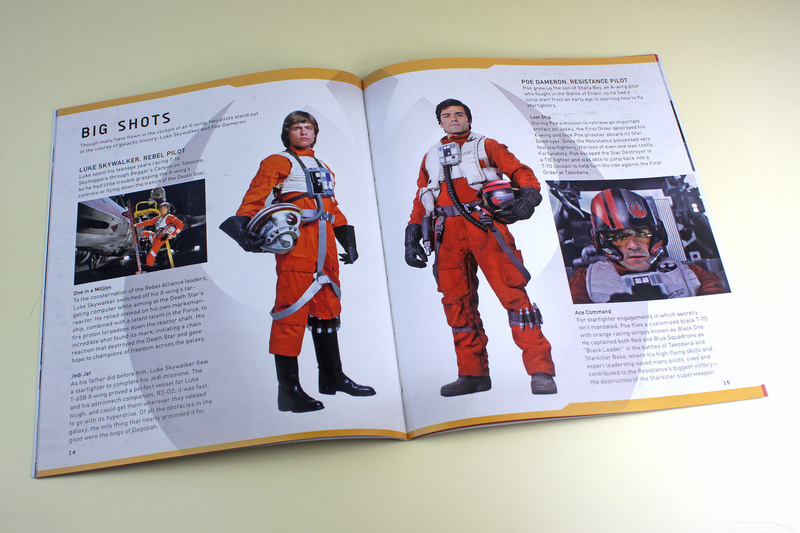 Topics covered include the history of the starfighter and its variants, signigicant battles, famous pilots, storyboards and concept art, and an interview with Richard Edlund (cameraman for the miniature and optical effects units on all of the Original Trilogy films). 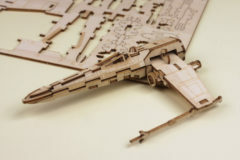 Overall, I found this an enjoyable little construction task, resulting in a pleasingly different representation of a very familiar Star Wars spacecraft. 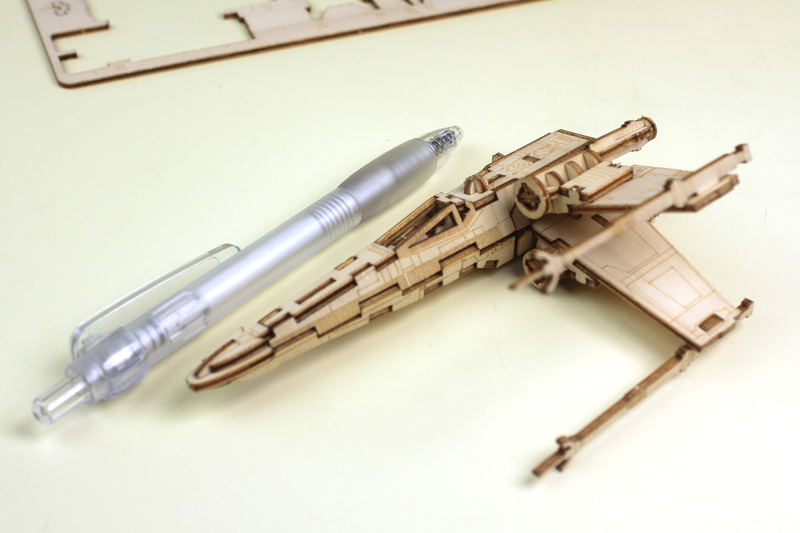 I look forward to adding more IncrediBuilds alongside this one (other kits include TIE Fighter, A-Wing, AT-ACT, Death Star, BB-8, R2-D2, and Millennium Falcon). 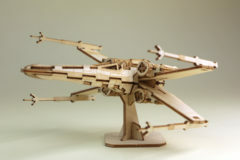 Star Wars IncrediBuilds are available at: Mighty Ape, Toyco, Whitcoulls, Retrospace, Real Groovy Records, Astroman, Arkham Comics, and EB Games. Stay tuned to SWNZ, where we will be giving away a couple of IncrediBuild sets soon.